Nodular growth with very bright surfaces having an esthetic combination of mainly red shades with yellow and pink. 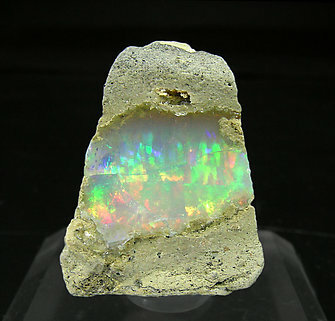 The locality is not so well known, so we think these Opals are on sale for the first time. Nodular growth with very bright surfaces having an esthetic combination of mainly red shades with yellow and pink. The locality is not so known, so we think these Opals are on sale for the first time. A novelty at Tucson 2010. 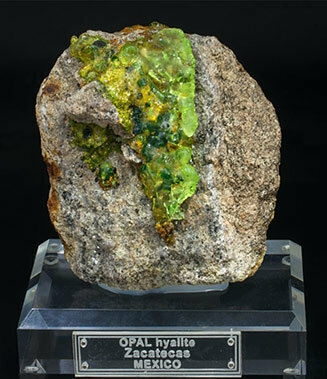 Opal on a matrix of dominant bluish shades with “harlequin” effect and green reflections. 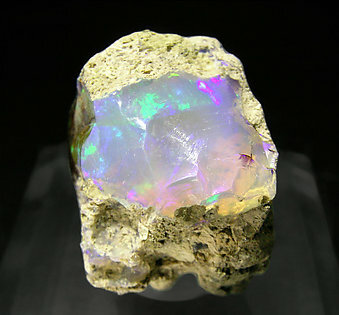 Although the Ethiopian Opal was previously known we note the detailed locality, so we can consider it a novelty. A novelty at Tucson 2010. 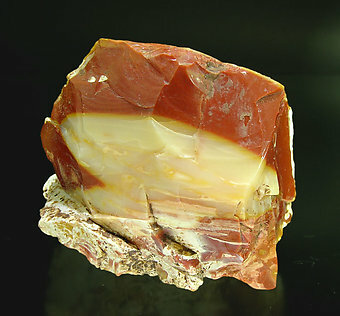 Opal on a matrix of dominant bluish shades with “harlequin” effect and reddish, orange and green reflections. 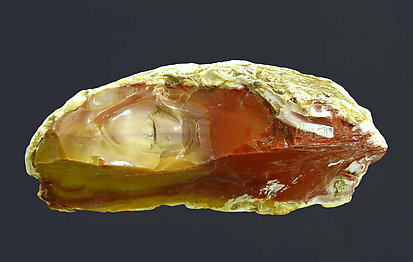 Although the Ethiopian Opal was previously known we note the detailed locality, so we can consider it a novelty. 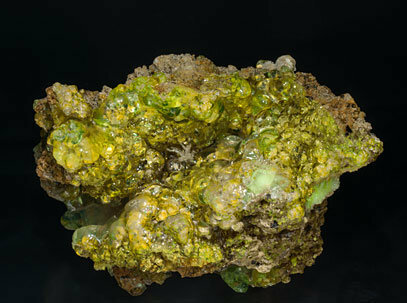 Clear and colorless botryoidal aggregate that is very bright, on matrix and is fluorescent with an UV lamp. 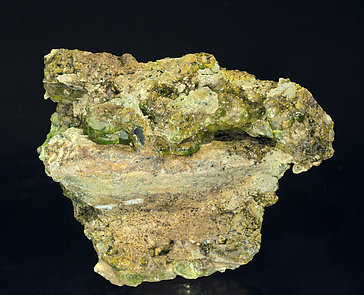 A precursor of the current hyalites from Central Europe. 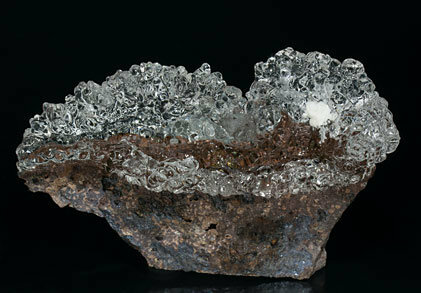 Very aerial botryoidal growths completely clear, colorless, very bright and implanted on a rocky matrix. 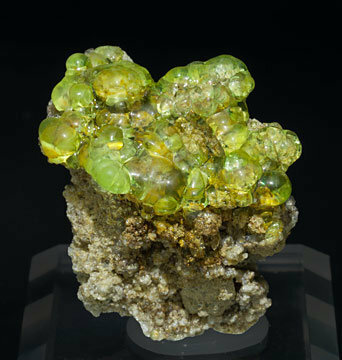 Very transparent and bright botryoidal growth on matrix. One of the best samples of this find. 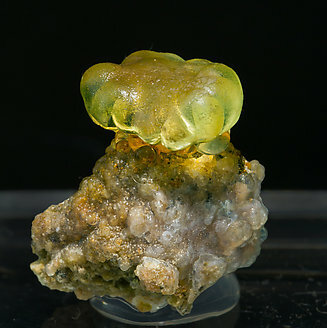 This type of Opal (variety hyalite), in addition to the fact that it is gemmy and quite aesthetic and stands up well on its matrix, has the extraordinary property of fluorescing in daylight! In fact, it fluoresces in almost all types of light: neon light, LED light, daylight and, of course, UV light. The only light with which it doesn’t react is incandescent. As the find is so new the locality is still very vague; sorry for that, but we are sure that time will clarify the locality as well. A novelty at Munich in 2014. 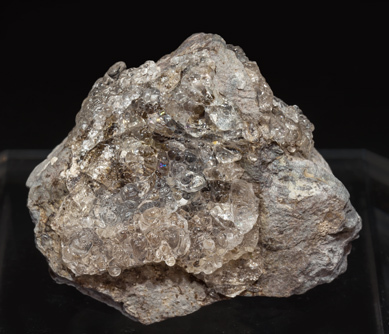 Very aerial, completely transparent and colorless botryoidal aggregate, highly lustrous, on rocky matrix. A novelty at Munich in 2014. 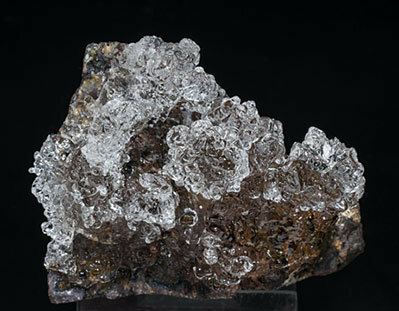 Completely transparent and colorless, highly lustrous hyalite in a crown-shaped botryoidal aggregate through which the rocky matrix is clearly visible. A novelty at Tucson 2014. 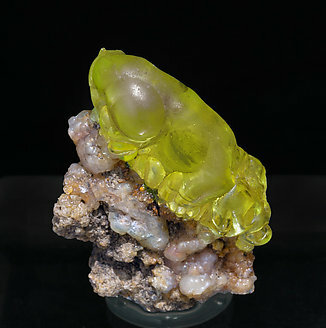 These Opals (variety hyalite) appeared for first time during the Tucson Show and in addition to the fact that they are gemmy and quite aesthetic, standing up on their matrix, their main feature is that they fluoresce even in daylight! In fact, they fluoresce in almost all kinds of light, neon light, LED light, daylight and, of course,UV light. The only light with which they don't react is incandescent. As they are so new the locality is still very vague, sorry for that, but we are sure that time will clarify the locality as well as the reason why they fluoresce so strongly. A novelty at Tucson 2014. 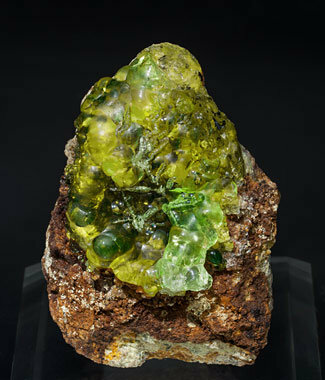 Transparent botryoidal growth on matrix. 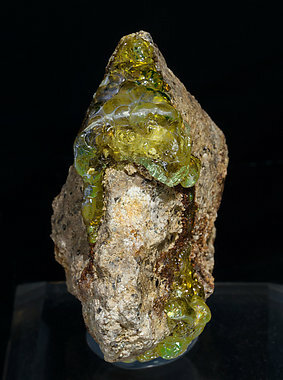 This kind of Opal (variety hyalite), in addition to the fact that it is gemmy and quite aesthetic, standing up on its matrix, has the extraordinary property of fluorescing in daylight! In fact, it fluoresces in almost all types of light, neon light, LED light, daylight and, of course, UV light. The only light with which it doesn’t react is incandescent. As they are so new the locality is still very vague, sorry for that, but we are sure that time will clarify the locality as well as the reason why they fluoresce so strongly. A novelty at Tucson 2014. 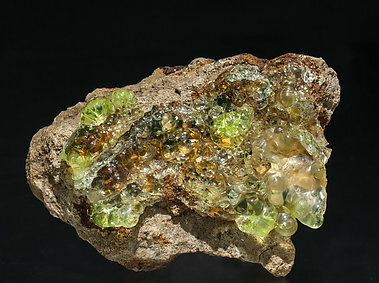 Transparent botryoidal growths on matrix. 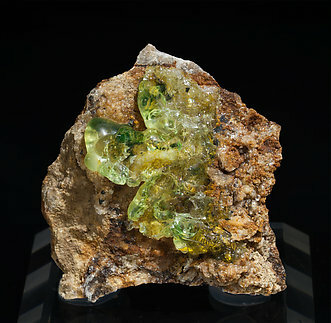 This kind of Opal (variety hyalite), in addition to the fact that it is gemmy and quite aesthetic standing up on its matrix, has the extraordinary property of fluorescing in daylight! In fact, it fluoresces in almost all types of light, neon light, LED light, daylight and, of course, UV light. The only light with which it doesn’t react is incandescent. 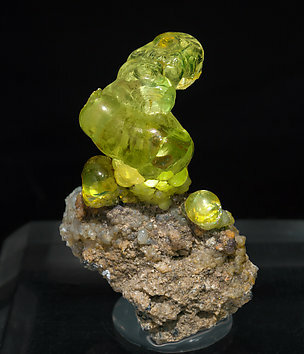 As these are so new the locality is still very vague, sorry for that, but we are sure that time will clarify the locality as well as the reason why they fluoresce so strongly. A novelty at Tucson 2014. 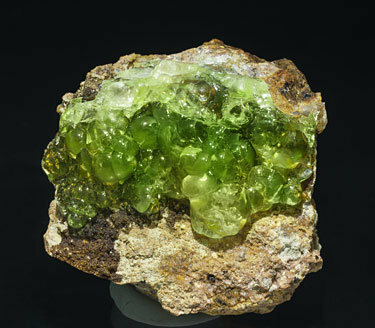 Transparent botryoidal growths on matrix, with small sprays of whitish, elongated and tubular forms. 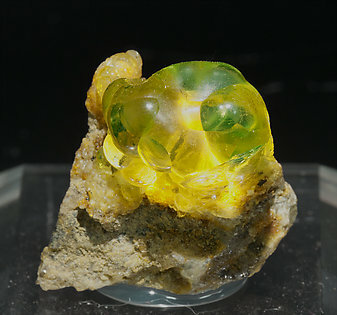 This kind of Opal (variety hyalite), in addition to the fact that it is gemmy and quite aesthetic and stands up well on its matrix, has the extraordinary property of fluorescing in daylight! In fact, it fluoresces in almost all types of light: neon light, LED light, daylight and, of course, UV light. The only light with which it doesn’t react is incandescent. 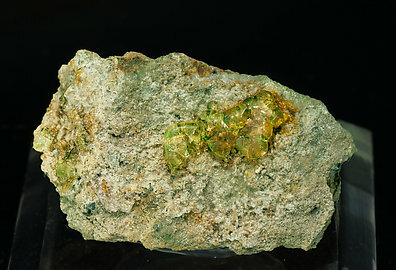 As the find is so new the locality is still very vague; sorry for that, but we are sure that time will clarify the locality as well as the reason why the specimens fluoresce so strongly. 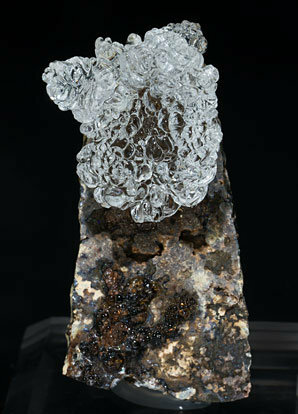 On this sample the peculiar tubular growths above cited, which you can see on the close-up image, caught our attention. We had them analyzed, and they proved to be an unspecified form of silica. We will send a copy of the analysis to the buyer. 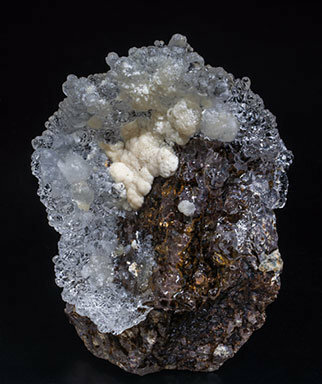 Very aerial botryoidal aggregates, completely clear, colorless, very bright, on a base of white botryoidal Aragonite and implanted on a rocky matrix. 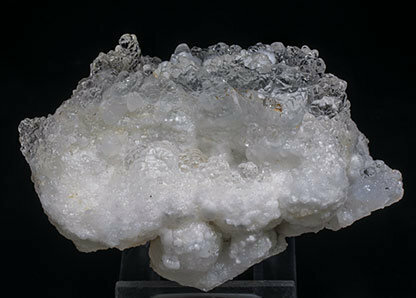 Crown-shaped growth of very aerial botryoidal aggregates, completely clear, colorless, very bright, with white botryoidal Aragonite formations and implanted on a rocky matrix.